Ethan enjoys "driving" while we wait for Landon to get out of school. 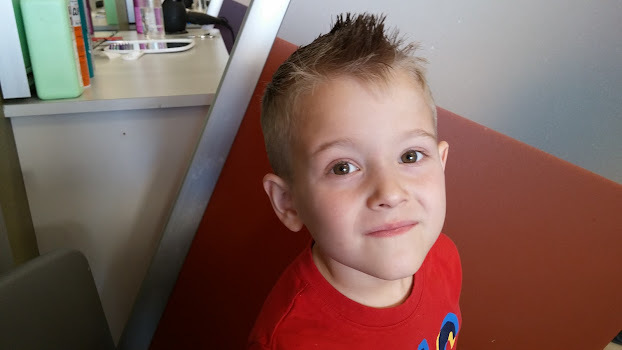 Dan took the boys to get their hair cut. They look super handsome!!! On our way home from my parents house I let Ethan try out Cade's big boy car-seat. He loved it! Occasionally we go to Udall to exercise as a family. It's a lot of fun!! On this night I was pushing Ethan and Landon in the stroller. While we were trying to catch up to Cade and Daddy, Landon was cheering " go Mommy, go Mommy, run faster, you can do it!" After we run the boys like to climb in the trees. One of those special moments snuggling up with a sleeping baby. Landon's school celebrated Love of Reading Week with a literacy parade. The kids dressed up as a character from their favorite book. Landon took one of our many Star Wars books and dressed as a Jedi. Cade didn't want to miss out on the fun so he dressed as Spiderman. Cade doesn't take naps anymore, but on this day he couldn't resist. 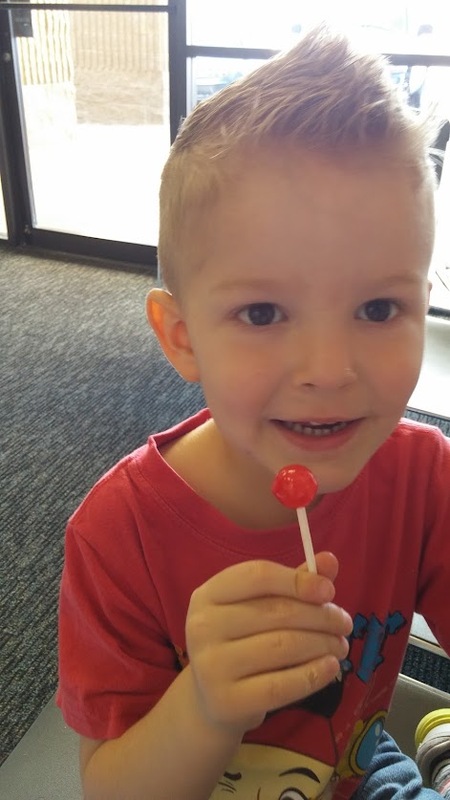 Once a month Landon's school earns a little money if you dine at a specific restaurant. We love Eegee's so we participated this time. My parents were having their pool re-plastered and Daisy didn't like all the men working in her backyard so she came over for a few hours. Ethan followed her around the whole time. Daisy loved "helping" me water the grass. 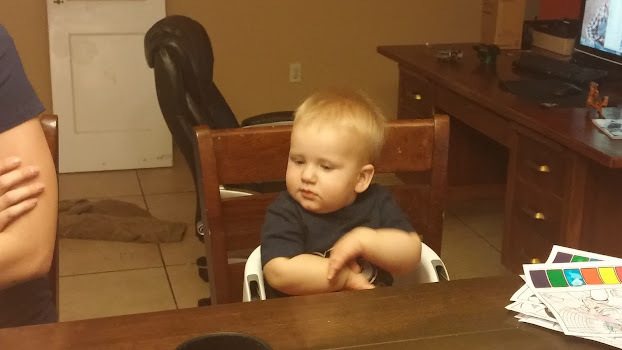 This one one of the first times Ethan folded his arms for prayer. We didn't ask him do to it he just followed the example we set. It was super cute!! I love when moments like this happen to let us know we are doing a good job as parents. Daisy came over again. I was feeding Ethan in a twin bed and Daisy joined us. Not pictured is Cade on the ground resting with is blanket and pillow on the floor. Everyone wanted to be with Mommy. As a reward for raising $250 for the school spell-a-thon the kids got to go on a limo ride to Peter Piper Pizza for lunch. I was a little nervous sending my baby on his first field trip so I volunteered to chaperon. It was such a crazy/fun adventure and I'm glad I went. Landon would have been overwhelmed without me. The limo we went on was called the "party bus". There was music, changing lights and lasers. At first the kids were very subdued while they took it all in. One they got comfortable they turned into crazy pint sized spring breakers. They were singing along to the music, dancing, jumping across the benches, and swinging and climbing the poles. It was quite the scene. After 10 minutes or so the little kinders were over the dancing and became more interested in looking out the windows. I talked Landon into going on the little roller coaster at Peter Piper. This was big deal for my sensitive little boy. The boys exploring Grandma and Grandpa Tidwell's emptied pool. No desire to walk yet but he can stand for a minute or so on his own. I can't believe how grown up he looks. Landon's school had a kinder rodeo. The kids dressed up and ate a cowboy breakfast on their bedrolls. Then they did a rotation of cowboy games like barrel rolls, horse races, ring toss, building ranches with bricks and a sack race. Landon borrowed Josh's old vest and chaps. I volunteered at the sack race. The kids had so much fun. Mrs. Roberts says this day is her favorite day of the year and that the kids remember it forever! The boys and I went to Phoenix to visit Aunt Cin. Ethan loved riding in this shopping cart. 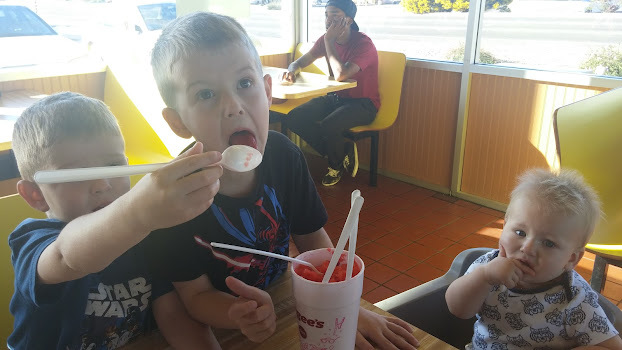 Before we headed back to Tucson we stopped to get something to eat. I had to get a picture of these guys with these silly ears on.